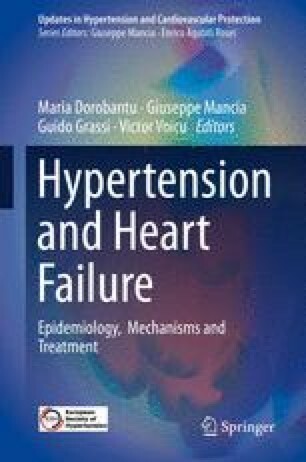 It is of importance to better understand the pathophysiological mechanisms leading to left ventricular (LV) maladaptation and the timely identification and management of patients at risk for developing symptomatic heart failure (HF). High blood pressure is the major modifiable risk factor for overt HF. In patients with hypertension, the process of myocardial remodeling/dysfunction starts long before the onset of HF symptoms. The long-term increased afterload (high pressure) and, consequently, the chronically increased cardiac performance lead to LV concentric remodeling, decreased longitudinal systolic deformation (strain), diastolic dysfunction, and increased LV oxygen requirements. All these processes eventually result in symptomatic HF. Recent studies revealed a high prevalence of asymptomatic (subclinical) LV systolic and diastolic dysfunction/remodeling in the community. In this chapter we discussed the different aspects of cardiac maladaptive responses to a chronically increased hemodynamic load. We also illustrated a complex interaction between the different components of blood pressure, arterial properties, and echocardiographic indexes reflecting LV function and structure.